Pianist and composer Kevin Field has collaborated with some of the top international names in jazz including guitarist Nir Felder, bassist Matt Penman and drummer Obed Calvaire, who all feature on his New York album The A List (Warner Music 2015). He has performed concerts in the UK, USA, Australia and New Zealand, and features on over 30 albums including Nathan Haines' recent release's The Poets Embrace and Vermillion Skies and recordings by such artists as Whirimako Black, Jennifer Zea, and The New Zealand Symphony Orchestra. 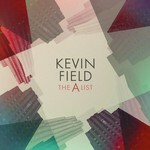 The A List is Kevin Field's third album. A natural progression from his previous 2012 release Field of Vision, The A List is a collection of sophisticated, polished compositions with a wide range of influences from '70s and '80s soul and funk to acoustic jazz, latin and even a bit of disco! The A List features compatriot Matt Penman, one of New York's first call bass players, having featured on over 100 major label recordings, Grammy award winning Sony Jazz guitarist Nir Felder and drummer Obed Calvaire who holds the drum chair with the crème of jazz and R&B artists including Wynton Marsalis, Mary J. Blige and Musiq Soulchild.